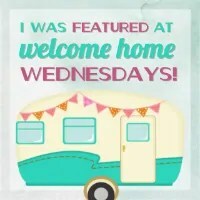 Welcome to Welcome Home Wednesdays #74!!! If you’re interested, I’ve teamed up with some awesome bloggers for a $100 Amazon Gift Card Giveaway! It’s super simple. Pop over and enter to win! And finally, we are so excited to introduce THREE new hosts to the party!! Kandice, Thea and Leslie are here to party with us! That expands our party to 8 hosts & 8 blogs! We are going to party like ROCK STARS here!! Please be sweet and stop by and visit their blogs to get to know them better! Like any good hosts we’re sitting right by the present table waiting until our guests leave so we can go through the loot… the loot being your Welcome Home Wednesdays #74 links! We can’t wait to check out what you’ve left for us. Trust me there will be a lot of pinning, tweeting and facebook sharing going on in the near future… we can’t wait to show off what you’ve left! Love your party! Thanks so much for hosting-following you all on Pinterest! Erin, I hear you on the disrupted schedule. It started back before Christmas and at this rate the kiddos will be in school until July! Just found out the grandkids don’t have school again tomorrow because of the snow so they will be over in the afternoon. Thank you for hosting!